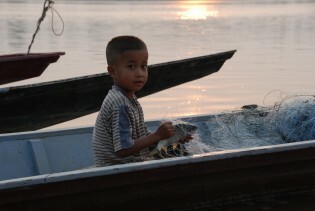 Impoverished Laos is unlikely to cancel a Thai project to build a mega dam across the Mekong River at Xayaburi, despite warnings from the International Union for Conservation of Nature (IUCN) that it could devastate the region’s rich biodiversity. Plastic trash is altering the very ecology of the world's oceans. Insects called "sea skaters", a relative of pond water striders, are now laying their eggs on the abundant fingernail-sized pieces of plastic floating in the middle of the North Pacific Ocean instead of relying on a passing seabird feather or bit of driftwood. Come May 12, South Korea will host its largest single landmark event for the year - an achitecturally-glittering Expo 2012 - continuing a 161-year-old tradition going back to the first Great Exhibition in England in 1851 showcasing the steam engine. Reacting to a series of deadly crocodile attacks, the Sri Lankan government has drawn up plans to capture the free-ranging beasts and confine them to parks. Conservationists oppose this move. A Catholic priest from the Philippines, a mother of three from Argentina, and the founder of the NGO Friends of Lake Turkana in Kenya all have one thing in common: they have helped to motivate their respective local communities to protect the natural environment around them and to stand up for their rights. So-called water schools, which educate communities on the resource and its links with the environment, gender and climate change, are helping to raise awareness on proper water management in Mexico, at a time of severe drought. Naseema Akhtar, 38, worries that her daily treks to collect clean water from the mountain springs around her village of Bonpora, in Kashmir’s Kupwara district, are getting longer. She is already doing more than seven km every day. In this eastern Cuban city, Danny Dip Leyva has begun to use her shower again after decades of hauling water into her house by hand. But in Aurora, a small neighbourhood on the outskirts of Havana, Manuel Roque still longs for a regular supply of piped water. Sahara Bibi, a 47-year-old poor Muslim woman living on one of the climate- impacted islands of Eastern India’s fragile Sundarbans archipelago in West Bengal state, was forced to pull her two young sons out of school and send one of them to the Southern state of Kerala to earn a decent income. As separatist militancy peters out in Kashmir, the valley is beset by armies of tourists who bring in the dollars but devastate the fragile ecology of ‘Asia’s Switzerland’. The saga of the Aral Sea is now a tale of two bodies of water. One holds the promise of a happy ending, the other remains enmeshed in tragedy. The United Nations, which is hosting a major international summit on the global environment in Brazil in late June, points out that while the world's oceans account for 70 percent of the earth's surface, only one percent of this area is protected. Empowering rural women in the Iraqi marshlands, who mostly remain off the radar of international support, must involve local languages and dialects as well as local women trainers, says Mishkat Al Moumin, founder of the Iraqi group Women and the Environment Network (WATEO). As non-governmental organisations question the relevance of the World Water Forum being held here this week and slam its "corporate" nature, the United Nations says that a coordinated approach to managing and allocating water is critical. The gentle waves of Weligama bay that lap at the small, tight-knit fishing village of Kaparratota, 140 km south of Colombo, can be deceptive. Two years after a severe drought wreaked havoc with a number of Caribbean countries, some are now adopting new strategies in a bid to prevent a repeat of a situation where countries were rationing water and imposing strict restrictions on residents.